When your child starts school in the Foundation Stage class at Langtoft Primary School, they are taught the broad range of skills and knowledge that provide the right foundation for good future progress through school and life. The standards we set are based on the Early Years Foundation Stage Framework, a framework that supports learning from birth to five. The Framework can be read here. As pupils move in to Y1 (and if they have achieved the Early Learning Goals of the Early Years Foundation Stage Framework), they are taught the knowledge, skills and understanding they need in the subject area of English as stated in the National Curriculum for England. Our school follows the National Curriculum. The Programmes of Study for English can be viewed here. Y5 and Y6 are also grouped together. Scroll down to page 31. The list of words for spelling in Y3 and Y4 and for Y5 and Y6 can be found here. We teach early reading and writing (including spelling and handwriting) through a scheme called Read, Write Inc., a systematic and structured approach to teaching early literacy. Devised by Ruth Miskin and used in more than a quarter of the UK's primary schools, the scheme is designed to create fluent readers, confident speakers and willing writers. We host workshops for parents in the Foundation Stage and in Y1 so that you can support fully your child's journey to becoming a fluent reader. You may find this clip from Youtube of interest. It shows how your child is taught to blend sounds together to read words. Click on the Read Write Inc logo to view it. 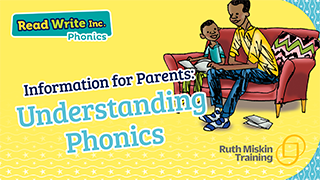 The Ruth Miskin website has an excellent series of short video clips designed to support parents understand how to say sounds 'purely. Click on the image below to watch.